Calacatta Marble looks great in a new kitchen. Unfortuantely, like most marbles, it is a soft material prone to chipping, staining and etching. Within a year of installtion, most Calacatta Marble kitchens look well used and abused. As a result, homeowners are advised to avoid Calacatta Marble countertops in their kitchens and this stunning marble has been relegated to bathrooms. For all you Calacatta Marble lovers, here is a new kitchen design tip! Diamastone has just introduced a new product, Nature Calacatta that is a stunning replica of Calacatta Marble. Nature Calacatta is a man made quartz material that resists chipping, staining and etching. Like all quartz materials it is durable and maintenance free. Marble is a counter fabricator's nightmare. Even though we use special diamond marble blades to cut the material and handle the material with extreme care, we inevitably end up with breakage either in the shop, transportation or installation. When fabrication or installation breakage happens, we are then left trying to match the marble from differnet slabs in the same block or a new block. It's never a happy story for the designer, the fabricator or the home owner. Recently we had the opportunity to make a counter top from Diamastone's Nature Calacatta quartz. Wow, what a dream material. Not only was it easy to work with, it was a dead ringer for calacatta marble! Marble and granite materials have been used as kitchen countertops and bathroom vanities for quite some time around the world. Marble typically only comes from a couple of locations on the planet whereas granite can be found on almost every continent. There are some very obvious pro’s and con’s to both solutions. Marble is a type of metamorphic rock composed mostly of calcite. Marble comes in a variety of colours and patterns, especially in the coveted light colours which people enjoy in both the bathroom and the kitchen. Unfortunately, marble has several disadvantages, it is very porous and can easily be chipped, cracked, or stained. It is recommended that marble is sealed often to maintain it properly. Granite is a crystalline stone that is known for being much harder. 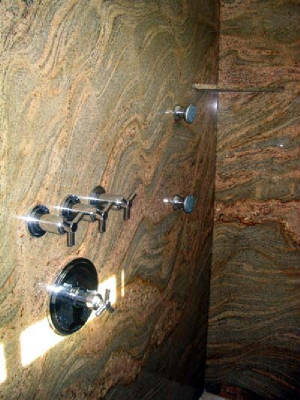 Granite also contains a medium to high concentration of quartz, quartz being one of the hardest minerals on the planet. When properly sealed, it is much more resistant to staining as it is less porous. Kitchen – Marble would be suited best in a decorative kitchen that does not have high traffic or children. There’s no question it adds elegance to any room but it is much less practical due to how soft and porous it is. Granite would make a much better choice for the average person with the amount of use their kitchen counter tops receive. Bathroom – This is an area of the house I personally would prefer to put marble, either as a stylish vanity or as unique marble shower walls. There is no real difference in cost between the two of them. If you’re shopping on a level by level basis they are exactly the same price here at Latitude. However, don’t forget to check out our ongoing remnant sale and you may be able to save up to 75% off which ever surface you choose. © 2014 Latitude Online, LLC. All rights reserved.